Shirts With Random Triangles: Nebraska Adds Three-Star WR Prospect Jaevon McQuitty To Its 2017 Recruiting Class. Nebraska Adds Three-Star WR Prospect Jaevon McQuitty To Its 2017 Recruiting Class. Jaevon McQuitty. Image via @JoshHelmholdt. Nebraska has a second commitment to its 2017 recruiting class. Columbia, Mo. high school wide receiver Jaevon McQuitty committed to the Cornhuskers on Saturday. McQuitty committed while he was in Lincoln, Ne. for Nebraska's Junior Day. 247Sports grades McQuitty as a three-star wide receiver prospect. 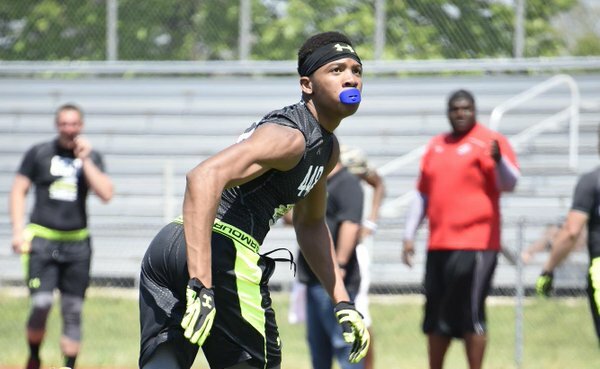 The recruiting site ranks McQuitty at no. 52 among WR prospects for 2017, at no. 4 among 2017 prospects from the state of Missouri, and at no. 346 among 2017 prospects nationally. McQuitty attends Battle High School in Columbia, Mo. He stands 6'2, and weighs 193 lbs.